I just finished signing up to join in with NanNoWriMo officially. 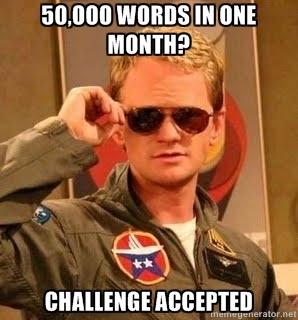 For those who don’t know, it’s a challenge during November in which writers try to write a whole novel (well, at least 50,000 words of one) in just one month. I’m in two minds as to whether I can actually do it. I did write a 65,000 word first draft in two months (and a couple of days) so it is achievable if I goal it seriously, but I have the typical ‘artist’ lack of confidence popping up reminding me I have a full time job (mum) and part-time job(shop assistant) that can destroy my writing time whenever. Of course ‘winning’ isn’t all that this is about for me, it’s a chance to get some more words on the page as fast as possible and an opportunity to do something very writerly. The really tough part is which idea to use. I have a couple that have been begging me to focus on them. T-J thinks I really need to write one of my ideas which isn’t cross-dimensional. He’s got a point, I might end up pigeon holing myself. So, do I go with the urban fantasy story about a single mum, her son and the ghost they live with, or the high fantasy story of a quest being done for all the wrong reasons? Well I’m on record now as saying I’m going to tackle this challenge seriously – so all of you have to hold me to it! You can check out my participant page here. Is anyone else doing NaNoWriMo? Do either of my very vague sentences strike you as particularly appealing?